This Retractable Rail Shelter can be created for door openings up to 10’ W x 10’ H. Designed to provide an air-tight passage way from the loading dock to the railcar door. When the spring loaded shelter is released it automatically extends and seals itself against the railcar. The rail shelter can manually retract when not in use to protect from moving railcars. Creates an air-tight seal blocking debris and other unwanted particles from entering. Three sided unit standard dimensions for door openings up to 10”W x 10’H are 11’W x 11’H back sloped to 10’6” front (O.D.) x 48” projection with 12” drop head curtain. Rail Shelter projection determined by measuring from inside first rail to building wall less 24”(2’). 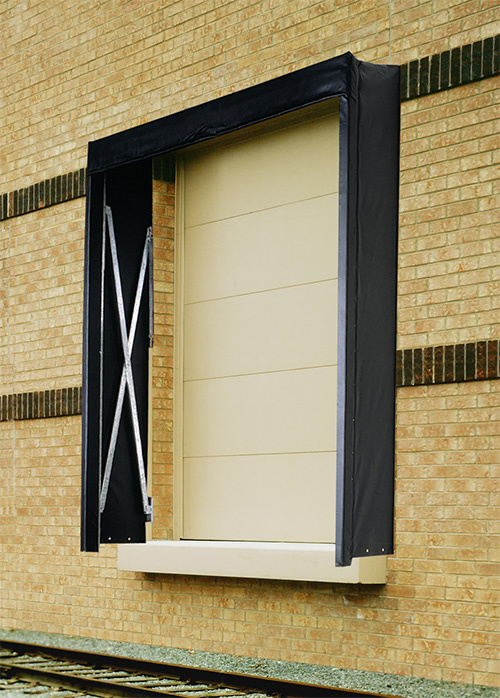 Designed to suit a large variety of oversized door openings heights, widths and/or dock projections. Mounting backboard frame to be constructed of top grade pressure treated wood. All steel components to be galvanized to resist corrosion. Unit to extend forward automatically on independent spring loaded galvanized steel scissor arms when released from building wall and shall maintain a constant pressure against the railcar. Unit is retracted manually by means of 2 pull chains. Fabric covered dense polyfoam vertical and head pads shall be provided at the leading edge of the shelter mounted in a formed galvanized steel channel for extra strength and rigidity. The vertical and head pad shall be constructed to give a weather tight seal against the railcar. Double stitched, high strength twisted 4 ply 100% polyester bonded thread U.V. treated used for sewing throughout.